Does Sara look like Mona Lisa in real life? Sara is much prettier than Mona Lisa. Her hair is short now too, so the picture would be very different today. That was before she donated it all to Locks For Love a month or so ago. She is also very vivacious, and you don't see her in the formal black suit with pearls most days. Yes Sara is much prettier than Mona Lisa but her picture reminds me of the famous portrait and the "enmigmatic smile." Maureen, now you've got me doing it to (getting off on a tangent and hearing songs). I was about to start my comment post with "Sara's smile..." and as I started to write that, I began hearing Hall & Oate's "Sarah Smile" song in my head. Stop that! Anyway, Sara's smile does look kind of like the Mona Lisa's but friendlier. That's great that Sara donated to Locks of Love. I found out just yesterday that my niece has been growing her hair long for the same reason. They only accept 10" minimum hair length, so she's letting it grow to her waist so when it's cut, she won't have really short hair. Sara smiles showing teeth... I remember something about virtuous women not showing teeth back in Leonardo's day... not a lot of photos with toothy grins... modern dentristy might have a lot to do with that. That is something to donate your hair... both Sara and your niece. Maureen M… WOW, a blog all of my own. I’ve spent the entire day chasing my tail. I couldn’t wait to get a spare minute to thank you properly for the “box”. After looking at the photo I would have to agree that I do look somewhat like Mona Lisa. How funny. You’d be on the floor laughing if you saw me today. Tank top, jean jacket, and camouflage gaucho pants…. A very far departure from the suit and pearls. The hair is indeed gone. I gave 15 inches about 2 months ago. 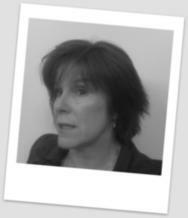 The photo I use for my AR profile was taken just about 8 months ago when I was still growing the hair out. Hence the Mona Lisa look! Gosh, I may need to plan a pilgrimage to your area to meet you officially. I suspect that Maureen F. would be up for it. Again, thank you for the post. You are officially my “M&M” because to me, you’re as sweet as candy! You are welcome... It seems Scott in Florida has a trademark on your Mona Lisa smile!!! Or on referring to your Mona Lisa smile?? Shouldn't I get that trademark?? Every time I see Sara's picture I want to break out into song in my best Nat King Cole voice. That smile could move armies. "are you warm, are you real, mona lisa? Or just a cold and lonely lovely work of art? Mona lisa, mona lisa." Sara Lipnitz, Sara Lipnitz.... same number of syllables. Updating blogs?! This one lives on. Got a message about the update in my inbox. Bring back Mona Lisa! updatings or deleting tags. I think she ought to come back too. I'm the "eye in the sky".... always looking, not making many remarks. It's possible that "Mona Lisa" can be pushed out of hiding.